The Australian carried a disturbing story today about a sermon delivered by Abubakar Basyir, widely regarded as the spiritual head of the Jemaah Islamiya terrorist network. Basyir allegedly told a group of young people in a sermon that they should start assaulting tourists and shoukd be prepared to die as martyrs. The Oz quotes Basyir's speech extensively. It then cites selft-declared terrorism expert Ronan Gunaratna on the implications of the speech. The Oz report is based on a video taken by Nathan Franklin, an Australian PhD student from Charles Darwin University. 1. I'm not sure what other languages Basyir or his audience speak, but I doubt their English language abilities are terribly strong. This raises the question: who translated the speech for The Oz? 2. I know he speaks fairly good Sinhalese (though his English is atrocious), but does Gunaratna speak any Bahasa Indonesia? If so, did Gunaratna get to see the entire video? Or indeed, did Gunaratna get to see any of the video? 3. If Basyir's descriptions of "[w]orms, snakes, maggots - those are animals that crawl" were to apply to all non-Muslims (as Natasha Robinson's report seems to suggest), and if Basyir really was as influential as claimed, how on earth did why did Franklin manage to openly film the sermon without himself getting beaten up for being a "snake" or "maggot"? 4. The Oz reports that "[t]he sermon was organised by the youth group Persatuan Pemuda Islam Pantura (Java North Coast Islamic Youth Group) and delivered on October 22 last year". We are also told that around 300 people attended the seminar. Who is the Java North Islamic Youth Group? Who are they affiliated with? And how is this current news when the sermon was delivered some 5 months ago and only 300 people attended? Basyir's comments, if correctly translated, are disturbing. However, they also reflect the resentment which many Indonesians feel toward a minority of foreign tourists who use their holiday in Bali and other places as an opportunity to buy, sell and consume narcotics and engage in acts which even most Australians would class as sexual deviancy. Charles Darwin University research student Nathan Franklin’s political studies will take him on a journey into the heart of Islam next year. The 23-year-old political science student whose honours thesis was on Schapelle Corby will spend up to eight months living in an Indonesian pesantren, an Islamic boarding school for students aged from 12 to 18. Nathan will spend three or four months at two quite different pesantren, both of them in Lamongan, about two hours journey from Surabaya in East Java. So these are Javanese schools from one province of Indonesia. They may or may not reflect developments across Indonesia. 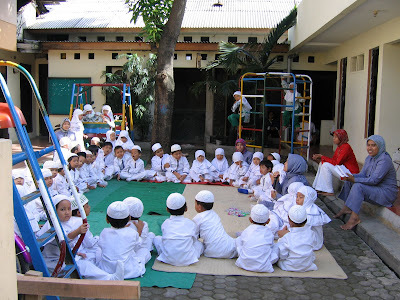 Pesantren have received adverse publicity in the West in the post-September era after the media identified some of them as training grounds for terrorists. In the Middle East and Pakistan the Islamic boarding schools are more commonly known by the name Madrasah. However, Nathan says that most of the pesantren are peaceful, tolerant and conservative places that have been unfairly tagged as the incubators of terrorism. Yep, that's right. A total of four (4). Out of 16,000. That means around 0.025% of Indonesian religious schools could be described as terrorist training camps. He begins his boarding school life in early December, 2006, staying at first at an 8000-enrolment school run by the moderate Islamic organisation known as Nahdlatul Ulama, the country’s biggest Islamic organisation with a membership of about 40-million adherents, most of them in remote and rural areas. He will then swap its crowded corridors for a 2500-student school run by the Muhammadiyah, a reformist organisation that wants to take Islam back to its ‘golden age’ roots along the lines of Shariah based values. Muhammadiyah is also a large Islamic organisation with about 30 million members. So The Oz ignores this part of Nathan's research. Little wonder they are more interested in what 300 people attending Basyir's one-off lecture hear as opposed to what 10,500 students in boarding schools run by the two largest Islamic organisations in the world are being taught each day. Yes, people can have a debate about caliphate without supporting extremist violence. Yet even more interesting is Nathan's perspective on why religious boarding schools are so popular in Indonesia. He says pesantren have become more popular in recent times since the Indonesian education system recognised their curriculum. In fact, boarding schools are playing a key role in the pos-Suharto democratic Indonesia. And this fact goes to the heart of Franklin's research. For his PhD Nathan seeks to examine the extent to which pesantren and its leaders are influencing politics in Indonesia since the transition from the authoritarian regime of President Suharto to a democracy. He says Australia must understand the internal dynamics of this important regional neighbour. 'A contemporary study of this nature is vital to achieving better relations with Indonesia,’ he says. It seems at least one newspaper may not share Nathan's vision. UPDATE I: Some far-Right wacko from Queensland has mentioned my post here on his online bog. Read this and wonder if modern medicine can find a cure for someone so ill.